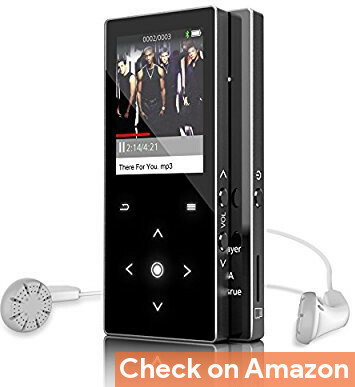 If you're looking for an affordable yet quality Bluetooth MP3 player, then you're are in the right place. Music makes us feel alive. Proper track helps us to reduce anxiety, to feel energized. It also helps to keep right part of our brain active. So listening to music can never be a boring or unhealthy task. Many of us use smartphone to listen to music. But to use smartphone while running, exercising or working out is cumbersome and it will leave you in a condition to charge your phone more than twice a day. Mp3 players are far better in this case. But there is worry to tangle up with the cord. Here it comes the new generation's choice - mp3 player with bluetooth. 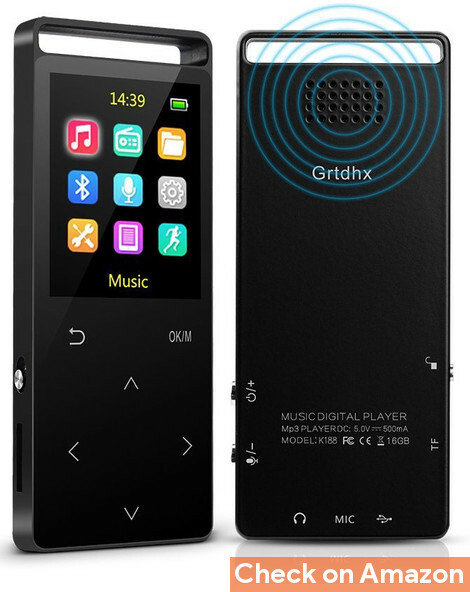 Due to smaller size, portability, flexibility and durability, mp3 player with bluetooth is very popular these days and makes it essentially significant for buying to every music lover. With bluetooth feel free from worry about tangled cables. But before jumping to the list check the features that make a mp3 player of good sound quality, indefatigable and what should you know before buying one. So that after checking the list you may choose the perfect one of your need by yourself. Size - The size of the bluetooth mp3 player should be small not crunky. So that it fits in your pocket easily and does not provide discomfort while walking, running, exercising and so on. It should weigh light too. Sound Quality - A pleasant track can be stressful, disturbing when you listen it with bad sound quality audio player.To enjoy superior quality music buy the one with high resolution or high definition audio quality. Battery life - Battery life is important. Bluetooth mp3 players with good battery life enables you to enjoy music for quite long time and you don't have to worry about to charge it every other day. Also you can enjoy music while traveling and do not have to worry about thinking of charging. Memory - To keep huge collection of songs a good memory space is needed. Some of the bluetooth mp3 players have enough in built memory. Some of them are expandable up to huge memory. Bluetooth - As it works with bluetooth connection so one should check bluetooth quality so that fast transfer of audio, video and other files to the player is possible. One should also check the bluetooth version to get to know device compatibility to output devices. Waterproof or not - Some of the bluetooth mp3 players are waterproof. If you are a swimmer, surfer or whatever and need something water resistant or waterproof then check this too. Price - So many products with same quality and features are available in the market . While checking the quality, check the price too and be sure you are not spending extra money for same quality product. Brand - Many off brand products are available in market with cheap price. Do not get befooled by buying an off brand chinese product just for sake of cheap price. Now once you have decided to buy a mp3 player, you may not settle down, thinking about which one to buy or which one is the best option available to you. To make it as easy as possible, here we are presenting the list of best bluetooth mp3 player available in 2018. Note- The list is not made in any such order like from best to worst or from worst to best. Each of the products are of best of quality at a particular price range. The legacy of Sony for it's legendary product quality is brilliantly maintained in this new launched product from A 40 series. 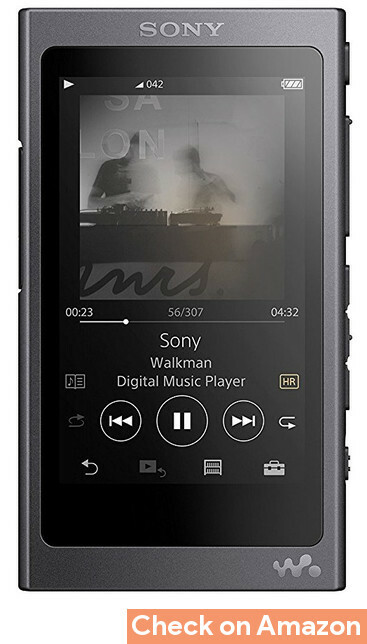 Sony Nw - A 45 /B walkman is simple and compact with stylish exterior. With high resolution audio and digital sound enhancer system get a feeling of studio quality sound. Hi-Res audio amplifier of it, helps to cut distortion & noise. Easy playlist and bookmark management, could be saved either on the internal memory or the SD card. Supports displaying lyrics, but you need to import the proper LRC file along with the audio track. Hi resolution studio quality music. Best in class battery life. Excellent product service and reliability. Screen is quite larger than other players. Regardless to say why we keep this bluetooth mp3 player from Sony in first position of this list. Though it costs a little more than average bluetooth mp3 players. But if you are voracious music lover and want to get the feeling like the artist is performing in front of you, this is for you. Ambient sound mode of it keeps you aware of surroundings. It comes in different colors. This tiny mp3 player with bluetooth is truly one of it's kind at this price range. With it's elegant yet durable build, and high quality audio, it's a perfect choice you don't have much problem to use a small touch screen. Other essential features of any MP3 players, like playlist management, add to favorite, shuffle, lyrics, file info are also supported, however not very convenient due to the tiny display. It packs some serious stuff inside the tiny package, delivers quite outstanding lossless audio quality with the ESS ES9218P DSP. More than that, this AptX compaitable bluetooth device could connect bidirectionally, i.e. either deliver audio to headphones or receive audio from another device, as example a smartphone. You could also connect the device to your computer to use it as a high quality DSP sound card, via a USB type A to type C cable. So, if you're looking for a tiny portable player, definitely this should be on your list. The second wonder of this list is from Grtdhx. 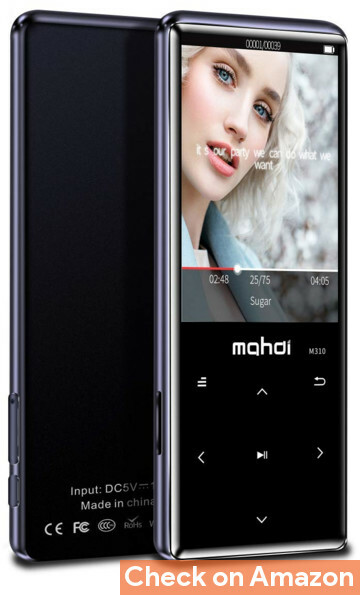 With lightweight, excellent hifi HD sound quality, clear screen and sturdy exterior it is one of the best mp3 player with bluetooth available in the market within affordable price. FM radio, voice recording, ebook reading options are available. It supports different languages such as english, japanese,spanish and so on. Anti - interference ability of it helps user to enjoy music without getting disturbed noise from outside. Bluetooth version of it enables high speed and stable transmission of videos, songs and other files to the player. With audio line input it can also be connected to computer. Armband is provided with the package. Kindly note, this cannot be paired with car bluetooth or smartphone. Well, the name is hard to pronounce, but the product is quite good at this price range. This bluetooth mp3 player is slim, sleek and stylish with shiny curved design. Tough metal shell and scratch proof glass makes it quite durable. It has excellent sound quality with low distortion rate. FM radio,voice recording and E-book reader functions are also available. Inbuilt 16 GB. expandable up to 128 GB. So, MYMAHDI this product is cheap yet quite usable, specially the large display with scratch proof front glass. However if you need a cheap music player for workout or other outdoor activity, it could be a perfect choice when combined with a wireless earphone. This product from AGPTEK has already won hearts of many music lovers. AGPTEK A01ST bluetooth mp3 player is slim, sleek and durable with fancy design. Bluetooth 4.0 enables strong anti- interference performance and high speed data transfer. High sensitive silent touch and smooth hand feel of it makes it very user friendly. Other functions like FM radio, audio recorder, e-book reading, Pedometer are also available. 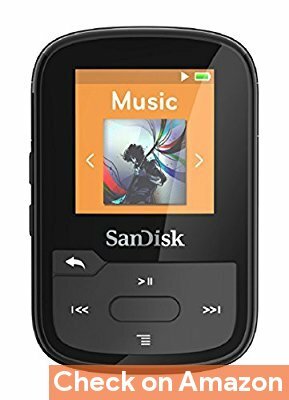 This is one of the finest mp3 players made by Sandisk and also one of the best bluetooth mp3 players available in the market. Sandisk clip sport plus MP3 player is small in size(smallest of this list too). It easily clips to your clothes, so that you can go for bike riding, running or exercising and able to enjoy music anytime. Built in FM radio is available. It is the only water resistant mp3 player with bluetooth support in this list. So, if you're looking for a compact and waterproof wireless mp3 player for outdoor activities, there could be no better choice than this product from SanDisk. Once again Dansrue is in this list. And it is Dansrue 8gb mp3 player with bluetooth 4.0. This one has in built FM radio, voice recorder and ebook reading function. Bluetooth 4.0 helps in fast and stable transfer of data to music player. 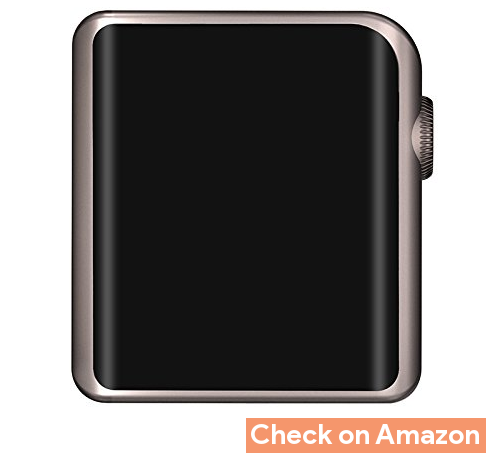 So, it's a fairly cheap product. You can go for it if you just something compact to listen music, instead of the smartphone. The seventh product of this list from Newiy. With stylish exterior, compact design, Hi-Fi sound quality, sensitive touch buttons and high battery life. Newiy start 8 GB music player with touch button, is one of the good bluetooth mp3 players available in the market within affordable price range. 500 mAh battery. up to 3 hours of music play. Newiy start bluetooth mp3 player is user friendly with sensitive touch buttons. It has inbuilt FM radio, voice recorder. Ebook reading function is also available. It has dual audio port also. You can insert two pairs of headphones at the same time. 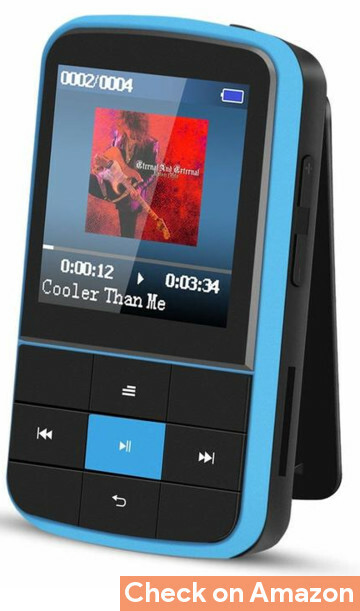 Thus sharing with your friend or loved one becomes easy with Newiy start bluetooth mp3 player. This product is from Valoin, one of those thousands retailer selling electronics online, specialized in music related products, digital voice recorder and accessories since 2008. 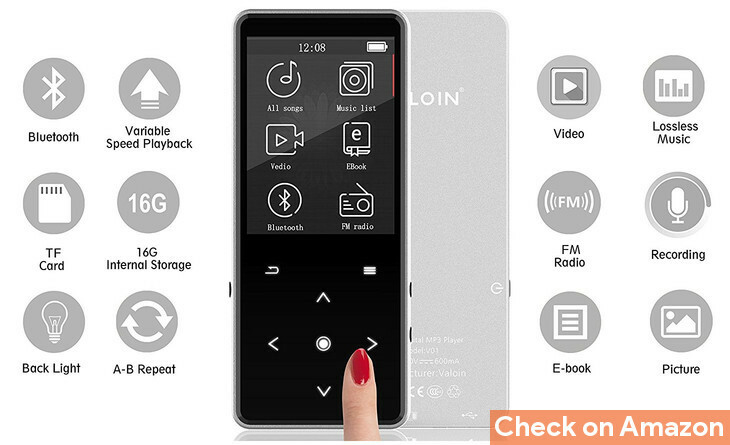 Valoin 16 GB mp3 player with bluetooth is a compact device with robust design. It’s 2.4 inch screen provides you comfortable viewing experience. With Bluetooth 4.0 high speed and stable transmission is possible within a range of 10 m.
USB 2.0 ensures quick transfer of music, videos and pictures into the player. With 7 sensitive touch buttons it is easy to use. Built in FM radio, voice recorder is also included. Ebook function allow you to read. txt files. Once again Agptek is in the list and it is Agptek G15 portable clip bluetooth mp3 player. It is small in size and weighs light. With Clip to fit to shirt or pocket and armband it is very sports friendly. You can enjoy music while walking, jogging or exercising. The product is black in color. This bluetooth mp3 player supports APE, WAV,FLAV etc like lossless audio formats. Bluetooth 4.0 enables to transfer music and other files to the player and connect seamlessly with all bluetooth speaker and headphone up to 10m. There is also inbuilt voice recorder, radio and book reader. It can be connected to car audio system with 0000 pairing code. P.S- Earphone is not present in the package. Another chinese off brand product. 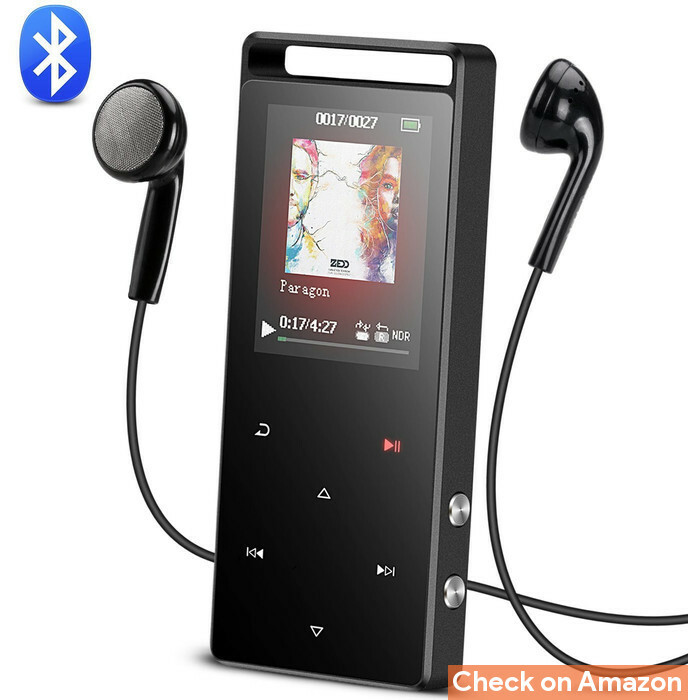 With high crushing resistance, high strength and excellent hifi sound quality, hongyo touch button 16gb mp3 player newest edition) adds elegant look. Hi-Fi sound quality and metal shell provides you excellent user experience. The inbuilt speaker allows you to enjoy music without earbuds. Digital noise reduction chip helps to reduce noise and gives clarity in sound. However this product looks surprisingly similar to another product of this list, Dansrue. Most of the audio formats are supported. There is inbuilt FM radio. Bluetooth mode is compatible with cars of 0000 Bluetooth pair code only. Owning all these facilities this product comes within affordable price. It can be a good surprise gift for your loved one. Though we don't recommend any super cheap off product, but they're lasts quite long for the price. The list of best bluetooth mp3 player is over. Hopefully, you have chosen the right one you want to buy according to your need and budget. We have made this list checking more than 50 of products available in the market. We always took into consideration that we are presenting the best products before you within justified price range. Buy the one you like most and enjoy music while walking, running, exercising or travelling. It is our responsibility to present the best quality products before you. We will be happy and our effort would be fruitful, if you could be more than enough satisfied after buying any of the bluetooth mp3 players. If you do not want to spend much money you can choose the bluetooth mp3 players with lower price from this list. You do not have to regret thinking about the product quality. Your love one or friend will be more than delighted, getting one as gift. Maybe I am in the minority but I do not like to use playlists. I need an MP3 player that lets me choose a folder on the memory card and then play all the songs in the folder. It works on Sandisk players and on the Sony player I had. Please let me know about folder support on the MP3 players. If I am working out I can only use my Sandisk Clip. Right now I only have 2 Sandisk Clip players.I like to use old my Android or Windows Phones without a SIM card as dedicated BT MP3 player / picture viewer. Also video playback and internal speakers are a total waste on such a tiny device. From the comments on most of these, it sounds like most don't support play lists, and file the music weirdly. Do you know any mp3 players that have bluetooth, are expandable to at least 128GB, and allow for play lists? The SONY products have it, any NW-A series product. Does NWA Sony séries has bluetooth connectivity??? Yes, both NWA 30 and 40 series has bluetooth connectivity. I own one of those GRTDHX MP3 players and I love it. The Bluetooth pairs flawlessly with my headphones and my home stereo amplifier. Music files download easily from my Dell laptop. The sound is really good. Clarence Penticuff must have received a defective unit. The seller will gladly replace it, if he contacts them. my comment has to do with the Grtdhx 16 GB MP3 Player. Your ratings must be based on stated features and not on actual physical use. I say this because this player the 2nd best on your list is a worthless piece of junk. First, the operations manual was obviously written by a non English speaker and is totally useless. I have not found a computer that recognizes this device to facilitate downloads. So far, I have tried it on two Apple's, 1 Dell, I HPand a SONY. The Bluetooth does not sync with any devices I own. The FM radio works but I have not listened to radio in quite some time. Obviously, all the UTubers are struggling as well because none of the videos on use of this device acutally gets on one to work. Finally, if this is your second best MP3 player selected from a sea of thousands then something is off. I suspect Grtdhx paid you a substantial amount to publish this article. Oh no, Grtdhx didn't paid me anything, but I wish 😀 . The ratings are based on reviews on Amazon, Ebay and various forums, as I can't purchase all the products to review them. Your genuine feedback is very much appreciated, and I'll replace the 2nd item with another well researched product. 1: Which of these players has variable speed playback? 2: Can all of them move slightly forward or back, by say, 5 seconds, so that missed parts of audio books or music can be reviewed? Didn’t really see one for swimmers. Still looking for best setup, for both music and audio. Bluetooth doesn't perform well underwater. In fact any device using the 2.4 GHz ISM band will suffer major range drawbacks under water, as the water molecules has almost same resonant frequency. So I've decided to exclude swimming or underwater related products, as all the items listed here are bluetooth mp3 player.